Harmonizing of EU labor conditions, lowered barriers to legal immigration and access to global labor markets are increasing the level, variety and intensity of diversity across Europe. This trend is likely to continue as Europe becomes even more unified in its pursuit of a single economy. We have seen amongst our corporate and government clients a demand for intercultural understanding. Because of the increasing diversity in Europe, we anticipate that the demand will grow. Our experience is that if it is not properly managed, the diverse workplace will be stressful, ridden with conflict and counterproductive. The symptoms we have already see are friction, misunderstandings and miscommunications, lost opportunities, increased cost of doing business, ineffective teams and a general loss of productivity. Multicultural teams have an enormous wealth of material with which to create innovative approaches to complex organizational challenges, and a great range of operating modes with which to develop new ways of implementing solutions. Today’s business cannot flourish without the creative value afforded by high-performing global teams. 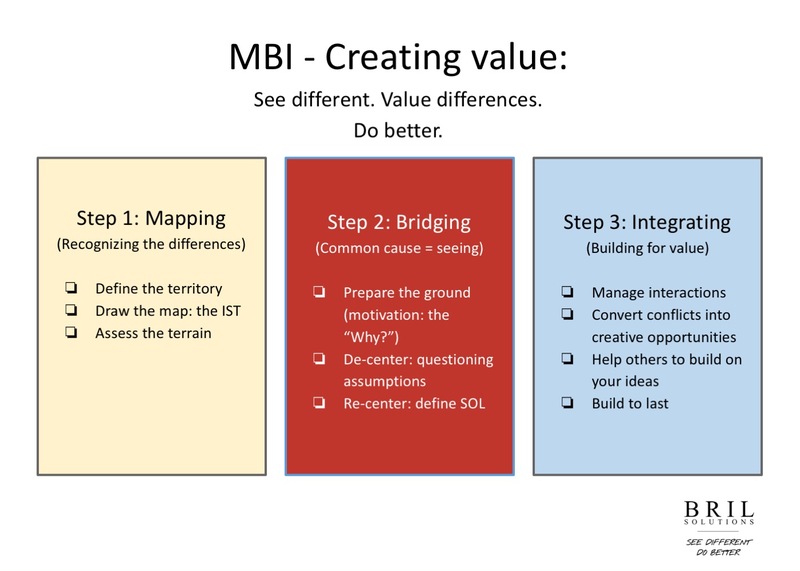 Mapping, Bridging, Integrating: Measurable increases in productivity and effectiveness can be gained by not only effectively managing differences in cultures among employees, but by leveraging the differences to provide added value. The techniques are simple and easily taught, and apply to a wide range of diversity. They can be used in a variety of environments, at all levels of the organizations. This is the key to unlocking creative synergy in teams’ interaction processes – how they understand, incorporate and leverage their differences. We’ve seen these unique teams create value by bringing highly successful products to market in record time, achieving quantum leaps in cost savings in a price-competitive industry, inventing new types of alliances with global suppliers and clients, and moving successfully into territory that others have been unable to conquer. You can see an animated presentation of how this model works in practice here. At BRIL.Solutions, we know you have worked so hard to get to the point where your international client is ready and willing to meet you, to discuss collaboration and making agreements. We recognise how much time, money and manpower has gone into reaching this point, and we want to see you make that deal and go global. Time and time again, company resources go to waste, simply because the international client has backed out of a deal at the last minute. Or you may have had an international team that didn’t perform as expected. If you have already had these experiences, you know how frustrating it can be. IKEA, G4S and the Dutch Railways have also been in your position. With the help of BRIL.Solutions, they’ve overcome these challenges. No matter how big or small your business is, we are committed to building partnerships with you to achieve similar results. Our greatest wish, however, is to see you succeed from the get-go. We want to work with you, to ensure that your perfect plan is, indeed, watertight, and that from beginning to end, you are following specific procedures that will build lasting value with your specific international clients. Clients from different countries have different needs and perspectives. These aspects can seem less important for time-constrained, global businesspeople like yourselves who want to follow established procedures and get results. However, as our past clients know well, your careful and appropriate consideration of these factors are what can, and will, lead you to either make or lose business. Choosing to work with BRIL.Solutions means that you conduct international business with confidence and competence. We will work with you on the level of both the big picture and the finer details: from the color scheme of your slide deck, to your body language, to understanding if you even have an agreement with your international client. It seems complicated, trivial even, but you need to get all of these things right to succeed in international business. At BRIL.Solutions, we make it simple. We provide you with the tools to be able to perform well in any intercultural environment, whether at home, abroad, or even inside your own company. By weaving what we know into your already solid practices, we create a bespoke offering enables you to create high performing, lifelong intercultural partnerships.